Paper transaction slips issued in the retail and banking industries are expensive, impractical and outdated. They pollute the environment, fade over time, get lost and are an irritation to everybody. Retailers are wasting millions on issuing paper slips! 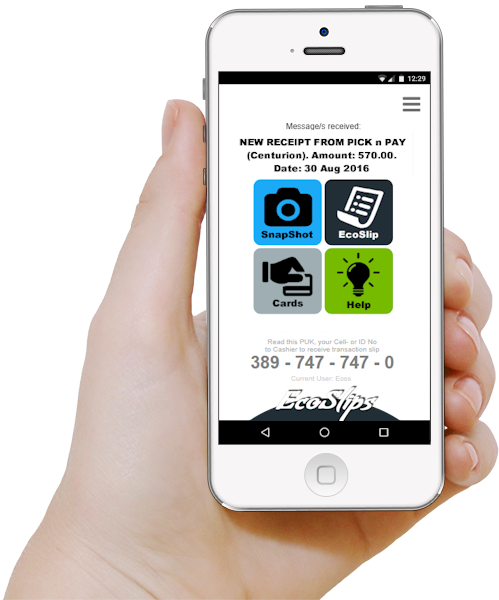 EcoSlips converts ordinary paper slips into digital, eco-friendly transaction slips that are sent to consumers' cell phones. 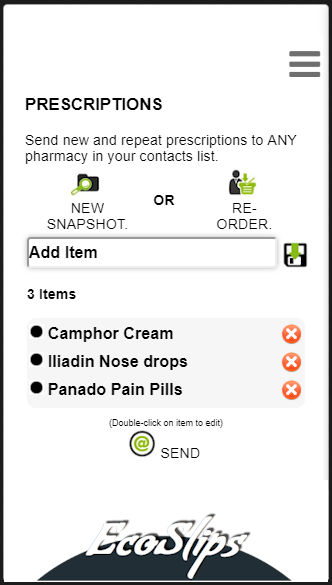 EcoSlips can be used to store electronic transaction slips, send prescriptions to pharmacies, submit expense claims and store shopping cards so that they are always available no matter where you are. We aim to provide ONE independent service that ALL consumers can use at ANY RETAILER, bank or pay point to save transaction slips safely in the cloud, where they are easily accessible at ANY TIME from ANY LOCATION. 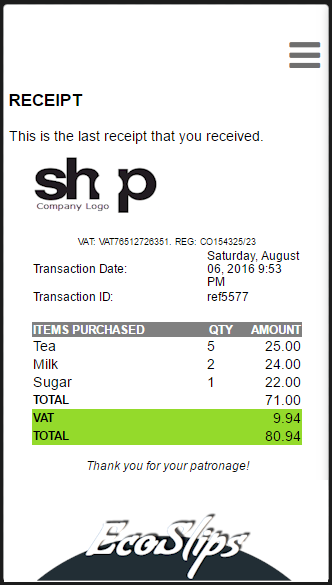 With EcoSlips all your cash slips, medical receipts and other transaction slips are available in the cloud 24/7. 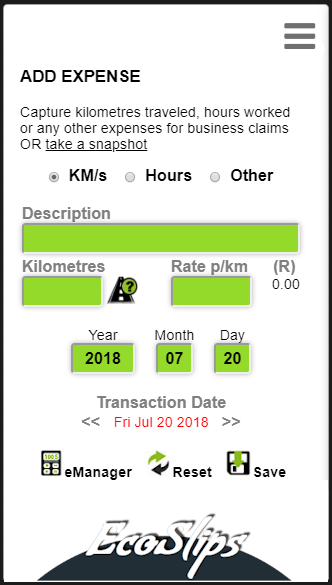 EcoSlips is used by people who want to keep track of their expenses and submit expense reports on a regular basis to provide proof of payment. 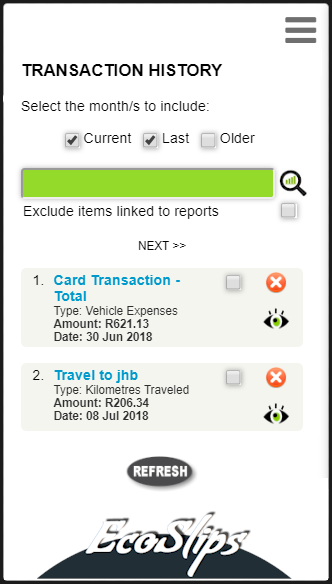 Drivers, sales representatives, small business owners, consultants and anyone else that need to keep track of their expenses and receipts. Download the app to your Android or iOS Smart Phone. When you register, a unique pin number is provided that can be entered at any participating retailer. 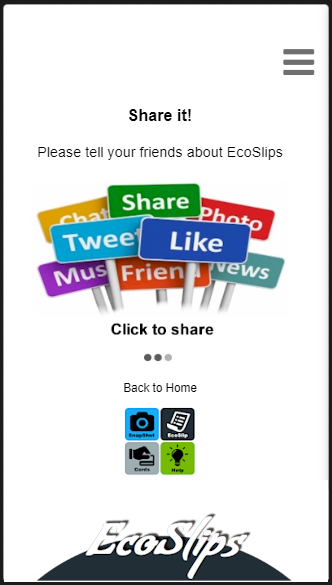 You do not need to share any contact details, such as your mobile number or email address with retailers in order to receive an EcoSlips. Swipe your debit/credit card, to receive a digital receipt on your phone. 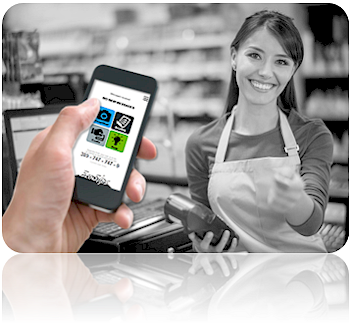 Where retailers have not yet joined you may simply take a snapshot and upload the receipt. 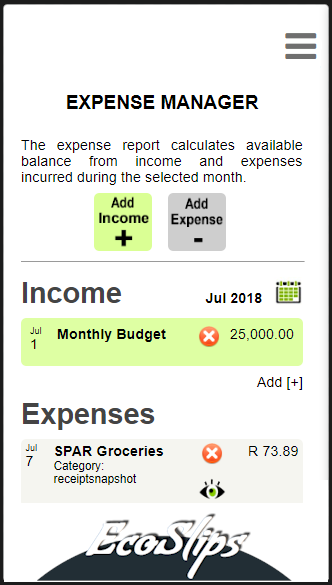 A neatly formatted expense report with all your transaction slips can be sent to your employer, medical scheme or tax authority, straight from your phone. 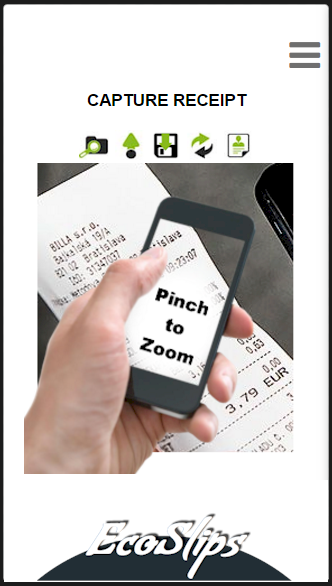 Receive transaction slips in real-time, on your phone, while you're still at the pay point. 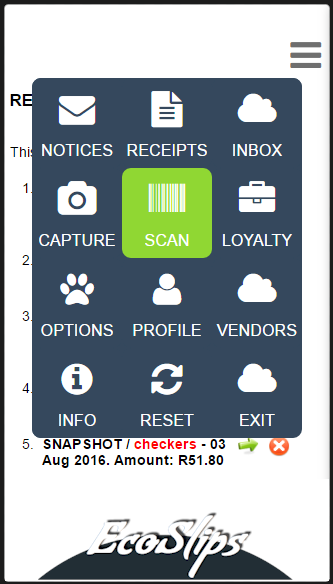 Scan any transaction slip or proof of payment manually when a retailer have not yet joined the service. 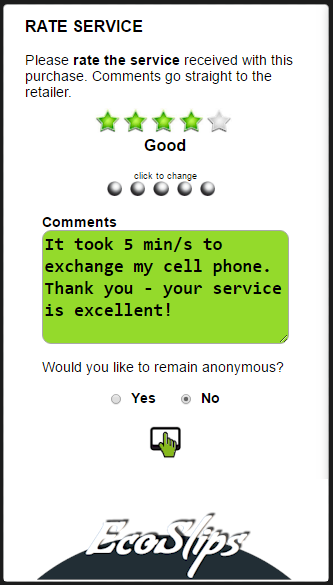 Send feedback directly to the store manager and rate their service. Organisations can use the system to collect transaction slips from workers while they make purchases out in the field. Retailers never get access to a subscriber's personal details or contact information. Download all your slips for a selected period of time in one printable report. 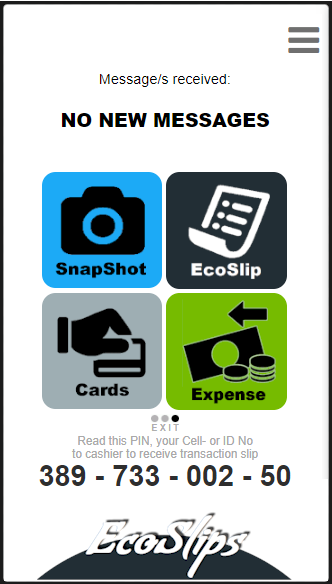 EcoSlips can be linked to loyalty-, bank- or membership cards. Linked accounts don't even have to scan a barcode. We have zero tolerance for spam. Retailers cannot contact you directly. 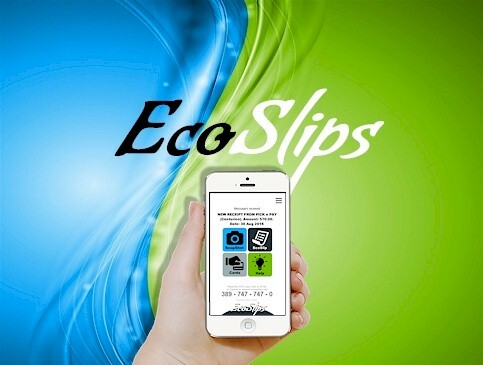 The EcoSlips mobile app can be installed for free. You'll have to download to see the rest. 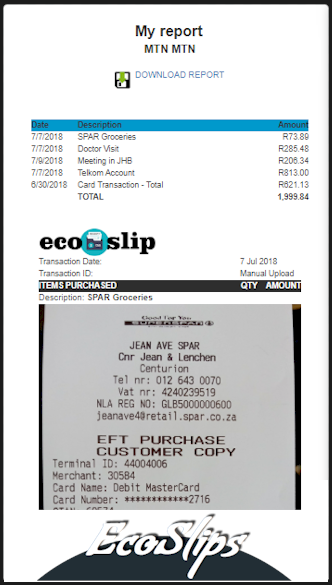 EcoSlips can be integrated with retailers, online shopping sites, banks, telecommunication networks, public services and POS software vendors to digitise their transaction slips. We also partner with payment switches and financial institutions that provide card processing services to their merchants. The digitisation service can be integrated with point of sale terminals, credit card devices, ATMs and any other transactional systems. 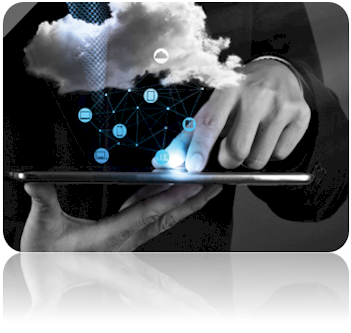 We provide detailed technical documentation that describes how to integrate the system. We will send your branded transaction slips together with contact details to clearly identify where the slips are coming from. Other value-added services, such as real-time customer feedback, geographic targeted advertising and transaction reconciliations are available. to contact us for more information. 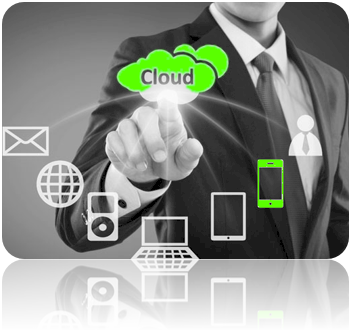 Direct support via email or phone is only provided to paying customers. (Free subscribers will find most of the answers in our Q&A section). When you need to store transaction slips online for longer than 30 days or process more than 10 transactions per month a subscription fee of $60 per year is payable. 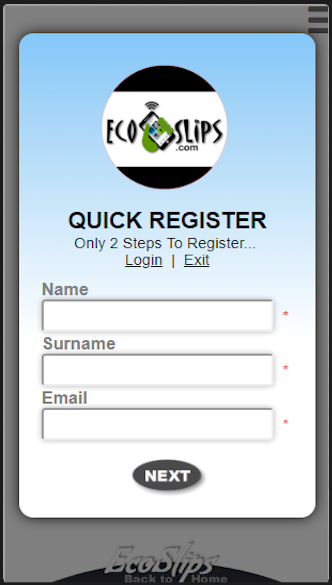 EcoSlips is a cloud based platform that consists of a website, message exchange service, administration system and integration services, linked to a mobile application. All these components are integrated to provide one coherent end-to-end solution. EcoSlips has won the MTN App of the Year award for Best Incubated Mobile Solution 2018. 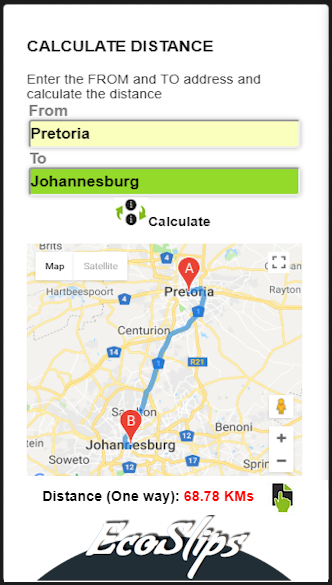 EcoSlips is a start-up based in Centurion, and was selected for incubation support via Mlab, MAXUM Business Accelerator and the SA Innovation Hub, which is funded by the Technology Innovation Agency (TIA).